Lovers of sweaters, crazy prints, and cozy layers should check out Elizabeth Spiridakis' Style Guide for H&M. I was really digging the whole feature, but one look was throwing me off. It nagged at me: where have I encountered this concept before? It's so familiar. "'For heaven's sake. Why are you wearing your sweater on your legs?' I asked. Karen had put each of her feet through a sleeve of her sweater and was now struggling to hold the bottom of the sweater around her waist. 'I have a feeling,' I said as I fastened the buttons, 'that this isn't what Nannie had in mind when she knitted this sweater for you.'" Karen Brewer, fashion visionary. Who knew. Love the mystery (it stars eighth grade badass Cary Retlin, who refers to the babysitters as the "BSCPD"*), am scared and confused about the cover. 1. Kristy! What happened to your adorable face? Who are you? 2. Cary Retlin's giant teal t-shirt. 3. Pink. sleeveless. mock. turtleneck. 4. Jessi's proportions. Also her face. 6. Mary Anne's orthopedic sandals. 7. No tagline. 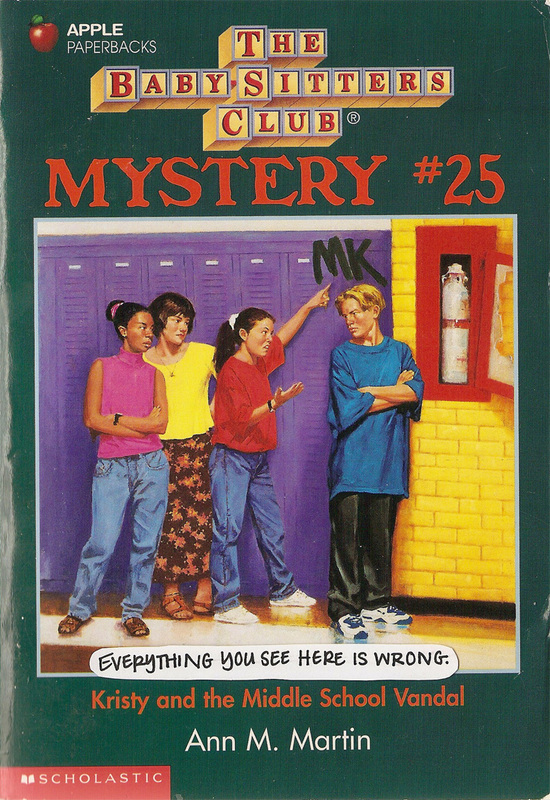 Apparently middle school vandalism is such a serious subject that the editors couldn't bear to take away from the power of the illustration. I'm sure there's more here, but if I stare at this thing any longer my brain might melt. It's like looking at the sun, or a bad trip, or staring at the sun during a bad trip. Powerful stuff, man. "On Claudia, with the long black hair, dark eyes, and creamy skin, every look is a great one. [Preach it, girl.] Today she was wearing pink jellies, white ankle socks with pink hearts around the edges, and majorly baggy white overalls, cut off just below the knee, over a tie-dyed pink, green, and yellow T-shirt with the sleeves rolled up. She had a ring on every finger and one on each thumb, including a heart-shaped mood ring, a ring with a little bell on it, a ring that looked like a cat winding around her finger [see also: silver leopard], a baby ring with her birthstone in it, and a ring she'd made herself out of clay and beads. Her hair was pulled back into three braids, which were tied together at the bottom with a pink and green ribbon. She had on her peace symbol earrings, too, and a button that said 'Jerry Garcia Lives' in black script against a tie-dyed background that matched her T-shirt. She'd made the button herself in art class." This look reads very Christeric (okay, maybe not the ankle socks or the braids) and I love it. I had to dig in her archives until I found this outfit, which I at one point had bookmarked as "CLAUDIA WOULD". I mean, right? "One of Stacey's best colors is black - a New York City thing, I guess - and today she was wearing black leggings, side-zippered flat black ankle boots with pointed toes, a silver-threaded T-shirt dress that stopped at mid-thigh, and heart earrings. Her fluffy blonde hair was pulled back with a twisted black and silver headband." Well, I guess I can't complain too much about this. "Cary was wearing my watch when I saw him at school the next morning - my watch and his watch, both on the same arm. It was a look Claudia might sport, I thought wryly." Kristy underestimates herself, I think. She's got an eye for this sort of thing! 'I like the jeans,' said Claudia. 'But the shirt has got to go - or at least, go with something else.'" * Way funnier than any joke Abby's ever made. Sorry girl. There's so much going on in this picture - all of it bad. Stacey's bangs have that distinctly crispy look to them (anyone who can remember the late 80s and early 90s knows a thing or two about crispy bangs), Claudia's flares are too short (sure, so were mine when I was a teenager, but I wasn't a baby fashionista who should really know better), and Zingy's is selling pink floral jumpers paired with long-sleeved white blouses. Isn't Zingy's supposed to be the Forever 21 of the Washington Mall? Not even Mallory would consider these duds trendy. "She believes clothes should do more than cover our bodies and keep us warm. Instead, she sees dressing as one more creative outlet, and it shows. She always looks fabulous, and she never looks just like everyone else. She'll pair a long white shirt with a colorful vest, accessorize with handmade jewelry, pull her hair up into an outrageous ponytail, and look like a million dollars." Girl slow down. What the heck is an outrageous ponytail? Is she wearing a Jem & the Holograms scrunchie? And where are her pants? 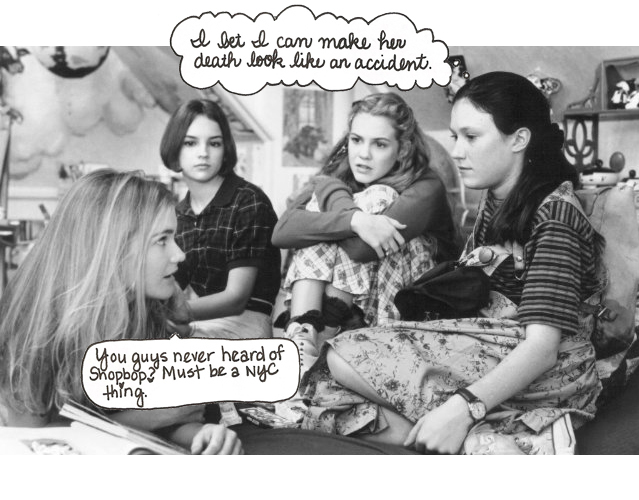 "'One of these days we're going to have to stay a little late and do some serious shopping,' said Claud, eyeing a white lace baby-doll dress. 'I'll ask my dad if he can pick us up one day next week.'" Dude, can you even believe this book has the nerve to promise shopping and not deliver? 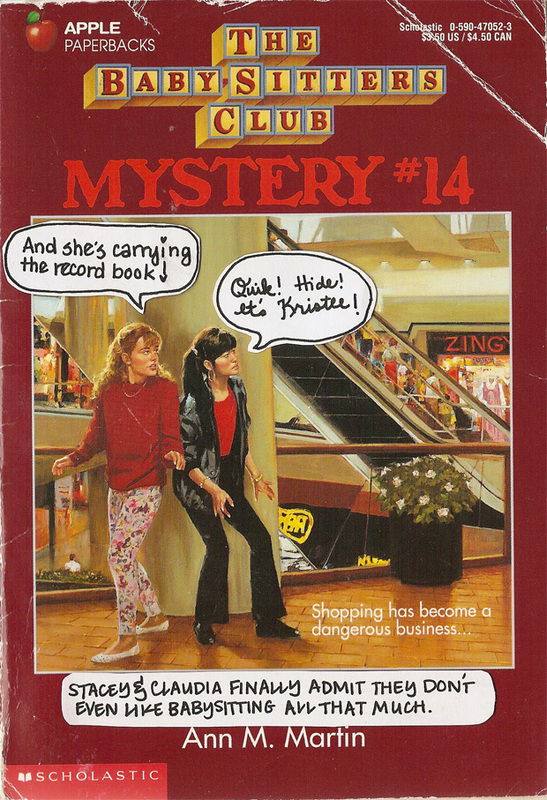 You'd think you'd get at least one actual shopping trip in a Mystery at a Mall. But no. We get one lousy sentence about Stacey gazing "at a pair of black lace-up boots and wonder[ing] how they would look with this old-fashioned floral-print dress my mother had given me." Not great. Now get shopping. "The next day, Sunday, my friends and I headed over to the mall for the painting party. Charlie drove us in Watson's van. 'You guys sure look different from the last time I saw you,' he said as he dropped us off. It was true. That afternoon, we had been dressed in our best clothes. This time we were wearing stuff we'd found in the rag-bag. Claudia, for example, had wrapped a neon-pink bandana around her head, and she was wearing a humongous pair of overalls over an ancient striped T-shirt." I don't know, Stace. 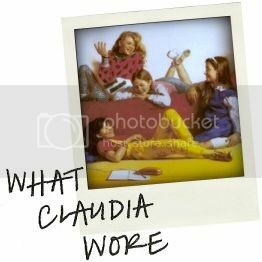 That sounds like a pretty typical Claudia outfit to me. It's time for another Shopbop $100 giftcard giveway! This one is brought to you by* DSQUARED2, Lela Rose, and Rachel Roy. To enter, leave a comment with your e-mail address and favorite Super Special. I'll pick a random winner in two weeks. You can also follow Shopbop (for fashion news, lookbook links, and Fashion Week updates) on twitter. 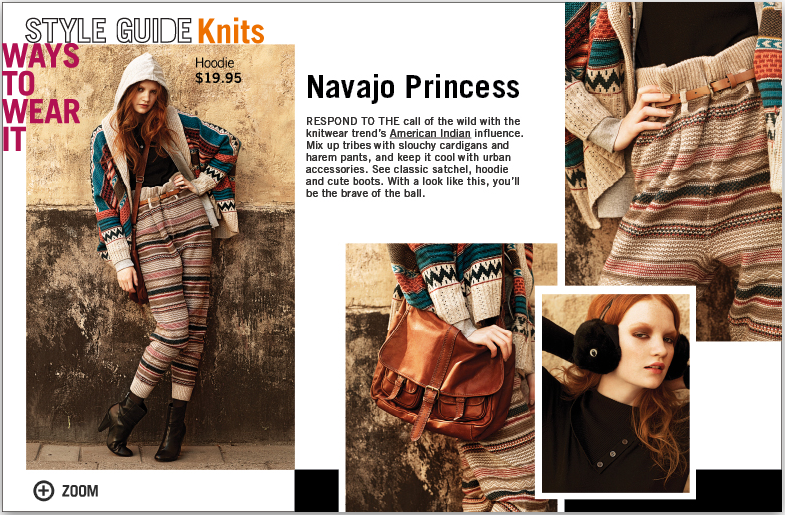 And if you need some wishlist inspiration, I'm dying over just about every piece in their Sophisticated 70s trend report. * Typing 'brought to you by' makes me feel like a PBS announcer.